One of the most distinctive professional attributes of recently appointed federal judge Wilma Lewis ’78 is her fervor for her profession—a quality she found in rich supply at the College. Nominated as the first woman judge to the District Court of the Virgin Islands by President Barack Obama in March 2011 and confirmed by the U.S. Senate in June of that year, Lewis has been a sitting judge since July 2011. For the St. Thomas native, the appointment was nothing short of ideal. Lewis’ career trajectory has taken her to some pretty impressive heights and includes a whole string of “firsts.” Her most recent advancement is her fourth presidentially appointed, Senate-confirmed post. Before her federal judgeship, she became the first African-American woman to serve as the U.S. Department of the Interior’s assistant secretary of land and minerals management (another Obama appointment). From 1998 to 2001, she was the U.S. attorney for the District of Columbia, the first woman to hold that position, and, in the three years before that, she was the first African-American inspector general for the U.S. Department of the Interior. Despite the disparate nature of each of those positions, Lewis says there have been key professional skill sets she’s come to rely upon. 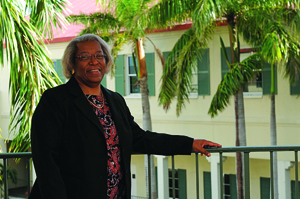 As a federal judge in St. Croix, Lewis hears civil and criminal cases and manages a complicated docket of more than 250 cases with a keen eye toward ensuring justice. “To be entrusted with the duty to fairly and impartially [make critical decisions] and independently address the matters that are brought before the court … is an awesome responsibility, because important interests are always at stake. It’s an incredible honor and privilege,” she contends, to be a part of the judicial system and involved with the administration of justice. 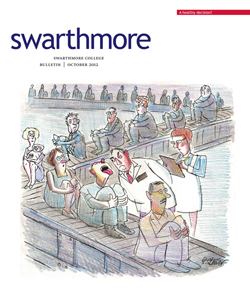 While Lewis seems relaxed as she discusses her role in the judicial system, her voice perceptibly speeds up and grows more animated whenever the topic of Swarthmore emerges. Throughout her career, Lewis has served on various boards and commissions, including Swarthmore’s Board of Managers. She also has maintained ties with the College through her participation in the Swarthmore College Alumni Gospel Choir.